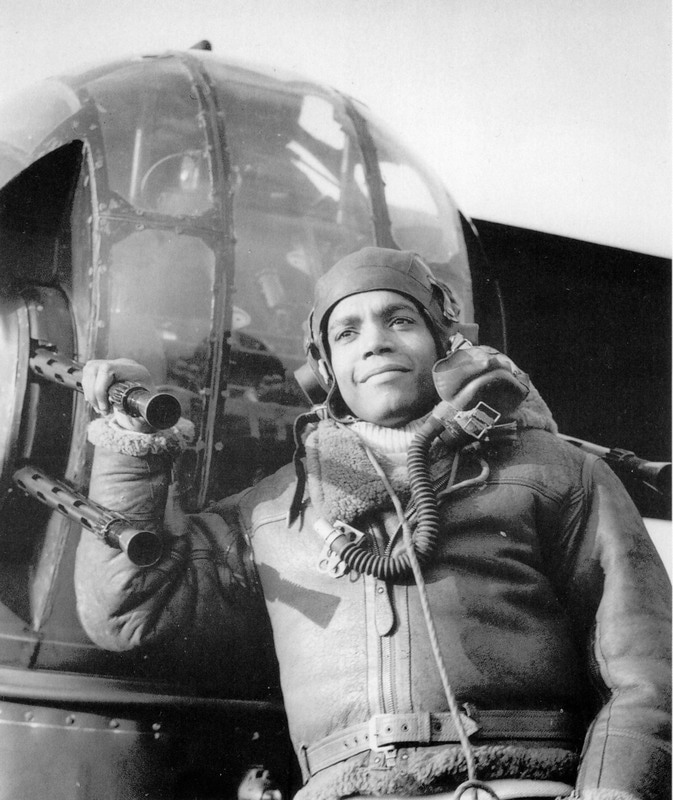 More than 400 men from the West Indies flew with the RAF in World War II as pilots, navigators, flight engineers, bomb aimers, wireless operators or air gunners. Some were stationed in East Yorkshire. Before the 4,000 RAF ground crew men arrived at Filey in 1944, a number of other West Indians had already joined the RAF as air crew. One of the first was Jamaican, William (Billy) Strachan. He arrived in England in March 1940, aged 18, just three months after he had left school. He had sold all his possessions (a bike and a saxophone) in order to pay his fare to Britain. When he went to the Air Ministry in Kingsway, London, to apply to join the RAF, the guard on duty outside told him to shove off. A sergeant came by and told him to go to his home town and join up. Billy said there was no recruiting office in Kingston (meaning Kingston, Jamaica) and the sergeant said of course there was, meaning Kingston, Surrey. Eventually a young officer came by and said he knew where Jamaica was – in West Africa – and took him inside. After a medical and various tests of his ability, by 9 o’clock the next morning Billy was in the Air Force and in uniform. Billy Strachan (far left) with his fellow crew members. Their plane was named Vizagapatam in honour of the people of the district of that name in India who paid for its construction. Billy survived his first tour of operations (30 missions) as a wireless operator/air gunner. 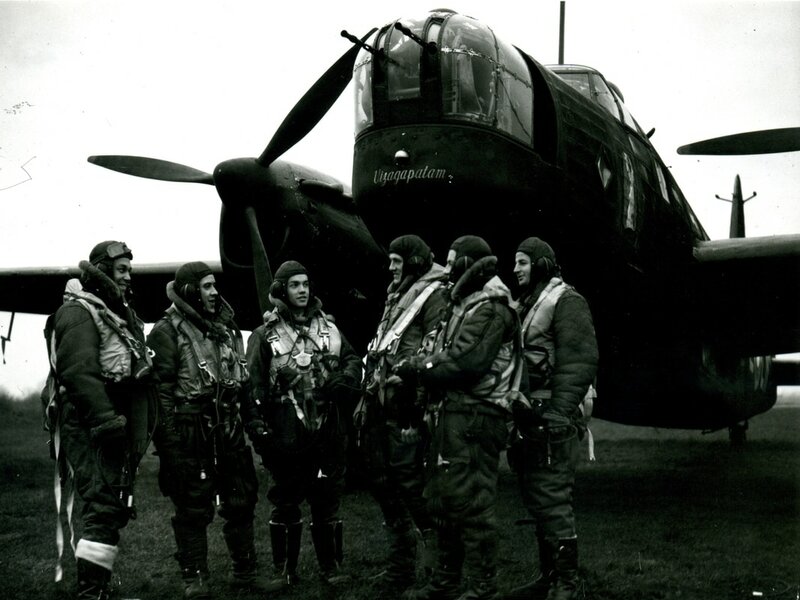 Many were not so lucky as the casualty rate in bomber command was very high. He was then entitled to a job on the ground but instead he applied for pilot training, doing a further 15 missions as a pilot with 156 Squadron, a unit of the élite Pathfinder Force. Starting out as a sergeant, Billy was promoted twice to Flying Officer and then Flight Lieutenant. He was stationed in Yorkshire for a time at Brough, near Hull. One day he was at the dentist having his teeth done in an underground surgery. When he came back upstairs after his appointment, he found that RAF Brough had been bombed and all the buildings were gone. After the war he served as a liaison officer in the RAF sorting out racial disturbances before studying law and becoming a legal administrator in London. He was a member of the communist party until 1967 and a political activist. After the course at Filey, the pair went to Scotland for familiarisation flying over the UK. Navigating the wide open spaces of Canada had been relatively easy, whereas in Britain with a new town every few miles and a blackout in operation at night it was much more difficult. John Blair eventually joined no. 102 (Ceylon) Squadron based at Pocklington, which flew Halifax bombers. Arthur Wint became a Spitfire pilot but where he was based for most of the war is unclear. Further research is needed, and perhaps a reader of this article can solve the mystery. He survived a full tour of 30 bombing operations and was awarded the DFC [Distinguished Flying Cross] for his services. He was asked to remain in the RAF after the war and served in Transport Command until 1963. For more details of John Blair’s career and many other West Indian aircrew, see Caribbean Volunteers at War, by Mark Johnson, Pen and Sword Aviation, 2014 (for a link click on the image to the right). Lincoln Lynch (right) became a rear gunner, a “tail end Charlie”, which was the most dangerous position on a bomber. He also joined no. 102 Squadron based a Pocklington. [they] had perhaps the least enviable role of anyone aboard. Unable to move and with nothing to protect them from enemy fire, they spent the mission flying backwards, staring out into the inky darkness in an attempt to spot enemy night fighters….Many tail gunners were killed during the war and it was not unknown for the whole tail gun assembly to be shot off with the gunner still in it, the aircraft returning home without him. The gunners were also responsible for the care and maintenance of their guns. Lincoln Lynch was already the holder of the RAF Air Gunner’s trophy of 1944 and a proven expert in the use and upkeep of his four Browning machine guns. Lincoln Lynch shot down a German aircraft on his very first mission and he would later receive the DFM [Distinguished Flying Medal] for his conduct. Later still, he was commissioned as a Flight Lieutenant, one of only a handful of RAF gunners to hold officer rank. I was only about five years old when I first had the pleasure of meeting Lincoln….He did on some occasions bring his friends to our house, one of whom was Arthur Wint….I do not remember a great deal about his friends who were not always coloured. The only reason I remember Arthur Wint was because he was so tall he had to bend down to get through our front door, so he must have looked like a giant to me! In May 2005, Lincoln and the sisters were reunited on a BBC1 TV programme, We’ll Meet Again, presented by Des Lynam and featuring Vera Lynn, which marked the 60th anniversary of VE Day. Godfrey Petgrave The son of a Jamaican father and an Antiguan mother, Godfrey Petgrave ​enlisted in the RAF in Lagos as his father was working in Nigeria at the time. Arthur Wint was a very tall man (height 6 feet 5½ inches) and a great athlete. Known as the 'Gentle Giant', Arthur ran in competitions for the Royal Air Force. After the war, he won a scholarship to train as a doctor and surgeon at St. Bartholomew’s Hospital in London. In the 1948 Olympic Games, which were held in London, he became the first Jamaican to win an Olympic gold medal in the 400 metres. He also won a silver medal in the 800 metres and probably missed a third medal when he pulled a muscle in the 4 x 400 metres relay final and was unable to finish. 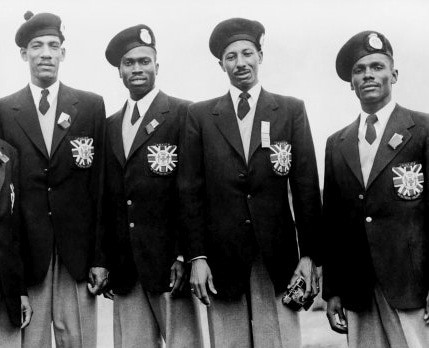 He won a further gold medal as part of the Jamaican team in the Helsinki Olympics in 1952 which set the world record in the 4 x 400 metres relay, as well as another silver in the 800 metres. He was awarded the MBE in 1954. After returning to Jamaica in 1955, he had a distinguished career as a doctor in Hanover parish. He served as Jamaican High Commissioner in London and ambassador to Sweden and Denmark from 1974 to 1978 after which he returned to his medical practice in Jamaica. Arthur Wint died on 19 October 1992. For more details of his life, see The Longer Run: A Daughter’s Story of Arthur Wint, by Valerie Wint, Ian Randle Publishers, 2012 (for a link click on the image to the right). Another air crew member who flew with 102 Squadron from Pocklington was London-born Vivian Florent, the son of an actor from St. Lucia. Click HERE to read more about him. Interview with Billy Strachan, 24 March, 1980. Caribbean Volunteers at War: The Forgotten Story of the RAF’s ‘Tuskegee Airmen’ by Mark Johnson, Pen and Sword Aviation, 2014, p.67. Caribbean Volunteers at War, p.71. Named Ceylon Squadron because the people of Ceylon (now Sri Lanka) paid for the construction of the planes. Caribbean Volunteers at War, p.52. Letter from Betty, 18 May, 2005.
 Letters from Mrs. Mollie Wray, 20 May & 9 June, 2005. According to Lest We Forget: The Experiences of World War II Westindian Ex-Service Personnel, (p.74), Godfrey Petgrave “went to Bridlington near Filey in Yorkshire where he did his ‘square bashing’.” This was probably at RAF Hunmanby Moor, Filey, rather than Bridlington.